Concepts: I typically imagine that unique science fiction is particularly difficult to write for roleplaying games. Few stand the test of time, like Travller, and many of the others are based on existing franchises such as Star Wars. 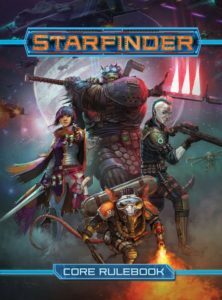 With Starfinder, Paizo attempted to do both – create a unique science fiction setting which was still very strongly rooted on their best-selling fantasy game Pathfinder. Using the same strong and modern adaptation of the classic d20 system as a backbone, Starfinder was intended to contain a lot of compatibility with its predecessor. But personally, I think it’s in the parts that differ from Pathfinder that makes this game truly shine. Writing: The rulebook contains several nice pieces of fiction which go a long way towards setting the atmosphere and tone of the game and to build the world (more of a universe, actually). Speaking of the universe, let’s discuss the game’s setting. Taking place in the far future of, but orbiting the same sun as, the Pathfinder setting, we are presented with a wealth of different planets into which we can travel. 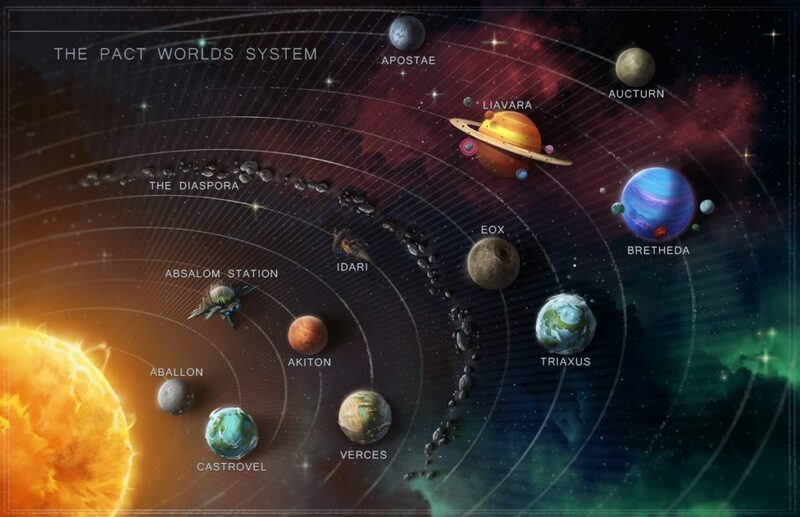 These include the bustling and cosmopolitan Absalom Station (which orbits where the planet Golarion once was before it mysteriously went missing), the jungle world of Castrovel, the space pirate infested wastelands of the Diaspora, the undead-infested death planet Eox, and many more – each of which has a vivid and unique history and culture. – Humans: Descendants of Golarion, young race of mammals. – Androids: sentient machines that were built as slaves but rose up and overthrew their creators. – Kasathas: Four-armed mystic seekers of wisdom. – Lashuntas: A highly telepathic race, recognisable by their retro style antenna. – Shirrens: Insect people who broke free from their race’s hive mind. – Vesk: Reptilian warriors, huge and with a strong code of honour. – Ysoki: Ubiquitous space-faring rat people who love technology and are often nicknamed ‘Rocket’. This variety of playable races is one of my favourite elements to Starfinder. Each of the above races has a fully developed and crafted backstory with history and culture, often intermingling with one another to give the universe a lived-in feeling. In addition, many of the races feel very unique rather than simply being a sci-fi version of existing fantasy races. It would have been very easy to simply create ‘space elves, dwarves and halflings’, and, in what might be a lovely move, these races are also included as optional extras at the back of the book. Their inclusion would create a far more retro vibe of play, but the inclusion of that option is a great move. Mechanics: Starfinder uses a modified d20 system based on that from Pathfinder, which means that anybody who has even a beginner level of experience with Pathfinder or even Dungeons & Dragons will be able to hit the ground running with this. The core mechanic of rolling a d20, adding your character’s relevant statistic, and comparing it to a pre-determined numerical value to confirm a binary positive or negative result is unchanged. Characters deal damage based on their weapons, with some classes preferring gunplay, others opting for spells or tech or solar energy. Instead, let’s discuss some manners in which this system works differently from Pathfinder and other similar games. Some elements certainly worthy of praise here include the option to point-buy elements of your character’s statistics, modifications to how magic is categorised and attributing level ranks to weapons (which definitely helps your GM in assigning loot on the fly). But my personal favourite alteration was to health points. Now as well as hit points, characters possess a number of stamina points – these points are easy to regain and act like a shield before the character begins to lose hit points. Meanwhile, your character has a pool of only a few Resolve points, which are used to resist death when your hit points gets to zero – these resolve points are also used to regain stamina and power certain other actions that vary depending on your class. When bullets start flying, these Resolve points are vital to staying in the fight, so it very quickly becomes a game of the players having to guess if they want to use them to top up their stamina, or hold onto them for the moment when they are truly on death’s door. That can make for some very exciting moments! – Envoy: Diplomats and leaders who often function as your crew’s captains and can give buffs or benefits to their team-mates and debuffs to enemies. – Mechanic: Experts in technology, able to craft their own pet-like drones similar to Shadowrun’s riggers, or integrate machinery into their own bodies a la cybernetics. – Mystic: A blanket class that incorporates empaths, healers, geneturgists, xenodruids and star shaman. – Operative: Covert ops, thieves, spies and ghosts who excel at highly-trained stealth. – Solarian: Combatants that can manipulate the power of the cosmos at their whims, using solar energy weapons, gravity and photons. – Soldier: Your traditional gun-toting heavily armed marine, with options for brawlers, explosive demolitionists, snipers, tanking and more. – Technomancer: As the name sounds, wizards capable of manipulating technology at a fine level with a fine eye to mystical augmentation. Characters also possess a theme, which can vary from anything from outlaw to xenobiologist or ace pilot. Like their race, this provides a minor statistic benefit and also grants additional benefits as the character gains levels. But more than that, it helps to provide an additional focus to the character and a sharper means by which the player can focus in on how they choose to play them, as different classes of the same theme will end up as very different individuals. That’s a lovely addition and feels very welcome in the game. Design: In terms of artwork and layout, the game is excellent. Art is consistent in style to Pathfinder, and in tone is fairly reminiscent of Mass Effect. Images feel gritty and lived-in, but also bright and vibrantly colourful. Character portraits feel powerful, and there is a strong variety of persons and body types represented. Pages are clearly laid out, with the text presented well with minimal need for excessively flipping through pages to find related content. The book is, however, very hefty – at over 500 pages it’s certainly a fairly intimidating read, and on several runs there have been reports of the binding struggling to hold up. Although my copy is currently holding up far better than my Shadowrun fifth edition, it may be worth consideration in future printings – especially as more and more rulebooks lean towards large page counts. Despite that, we found the rulebook to be a well designed and structured volume. Playability: It goes without saying that the game runs extremely nicely. Using a refined d20 system, action tends to work in fast rounds with little downtime between turns. The universe feels aged and lived-in, with enough secrets and plot hooks to provide ample motives for players and GMs to get involved. One thing that we did find is that starship combat can, at times, feel a little clunky and is occasionally difficult to run smoothly without a full compliment of players, but the sheer scope of action and adventure that the game offers ensures that this never becomes a contentious point. More often then not, combat will become a game of hedging your bets, pushing your advantages and hoping that the next roll will be the one that you need. However, at this point we do need to dock the core rulebook a few points as it lacks enough adequate antagonists for the characters to go up against. Obviously nobody is expecting a full bestiary, but given the book’s already considerable size it is a little bit of a missed opportunity to include a few antagonists onto three or four pages, simply to get the game going as of the customer’s initial point of purchase. This is, perhaps, more indicative of Paizo’s general sale and subscription structure, which players who want to commit to this franchise should note. Conclusion: As of 2018, Starfinder is reported to be the world’s 2nd highest-selling tabletop RPG game, and for very good reasons. It offers a genuine push forward for the modified d20 system, along with a sci-fi setting that genuinely works and stands on its own as a worthy environment for adventure. We are genuinely looking forward to seeing what surprises Starfinder brings to our gaming table. 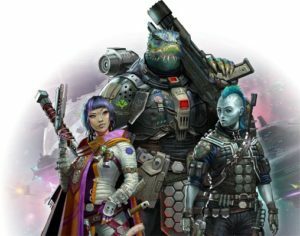 FINAL THOUGHTS: Probably the best game of 2018 and, although firmly rooted in Pathfinder, feels very much like a new contender in the tabletop RPG market, with enough uniqueness to stand alongside any other long-running science fiction franchise.